Aloft atop the swells of the Atlantic Ocean some 1,000 kilometers from North Carolina and a whopping 1,500 from the Caribbean mainstay of Puerto Rico, the curved archipelago of Bermuda has one foot in the tropics and another firmly in the Atlantic Hurricane Belt. Influenced by its long English colonial past, the towns here are loaded with whitewashed cottages and dotted with the occasional Gothic church tower. There are great fortresses left over from the times when Her Majesty’s Navy docked during the wars – even if the jetties are largely dominated by colossal cruise liners these days. The beaches are picture-perfect to the T, with handsome Horseshoe Bay and other coral-coloured sand stretches coming up trumps. These line the shores underneath palm and calabash forests, or below clifftops where luxurious resorts and spas and world-class golf courses sprawl. Yep, Bermuda’s a truly beautiful spot with plenty of things to do and see on its Anglo come Carib menu. Nestled between two rugged boulders of volcanic rock on the southern bends of Main Island, the shimmering golden sands of Horseshoe Bay rarely fail to impress. Sloping neatly down into the Atlantic Ocean, they are lapped by light whitecaps from morning until night, dashed with the occasional hue of pink thanks to the crushed corals along the shore, and feather out from the undulating dunes that separate the beach from South Road at its back. Famed across the globe as one of the most picturesque seaside spots on the planet, this one’s simply not to be missed. Be sure to arrive early though, as the crowds can get overwhelming – especially during the summer high season! Located smack bang in the middle of Main Island, pretty Hamilton is the beating epicentre of Bermuda’s cultural and economic life. It’s also imbued with some of the most enchanting colonial relics of any city in the Caribbean and North Atlantic – just check out those Gothic towers and buttresses of The Cathedral of the Most Holy Trinity, rising like some medieval English church in the midst of the town. Meanwhile, the Bermuda National Gallery beckons with its touring collections and exhibitions of local artists, while Monty’s and the Robin Hood Pub belie the town’s British roots with their hearty Ales and Anglo cuisine. Be sure to pick up an official guide to the Railway Trail from the government offices in Hamilton before heading out to join the winding walking and biking paths that now occupy the old route of the railway tracks that went from St. George’s in the west all the way to Somerset in the east. In fact, this pretty backcountry path offers one of the most comprehensive ways to see the island of Bermuda. It passes breathtaking sections of coast, goes by the rocky bays of Coney Island, cuts through the stone of Rural Hill and traverses the palm gardens of Frank’s Bay, following the same line that the historic 1930s carriages once did. 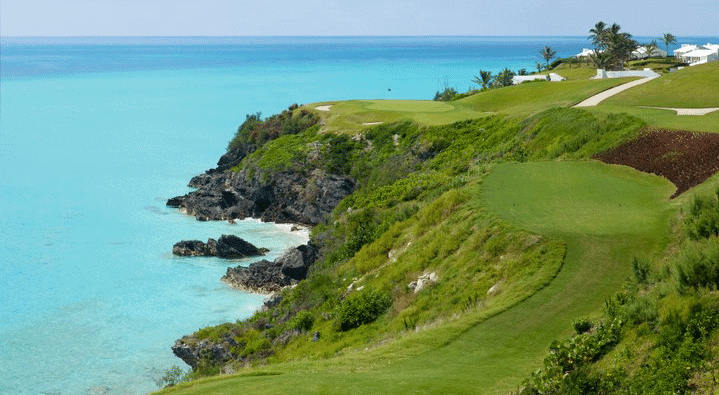 There are plenty of reasons why Bermuda is considered one of the most accomplished and coveted golfing destinations in the Atlantic, nay the world! Just check out the shimmering green undulations of the fairways and rough over at Port Royal, encompassed by the crashing waves of the ocean just south out of Hog Bay. This legendary public course is celebrated around the globe, and hosts that famous 16th short hole – one of the best known links threes in the game of golf. Other options for travelers with clubs in tow include the Mid Ocean Club and the refined Belmont Hills club on Harbour Road. Located right on the join between St. David’s Island and Main Island, the subterranean passageways and tunnels of the Crystal & Fantasy Caves remain some of the most awesome backcountry attractions in Bermuda. 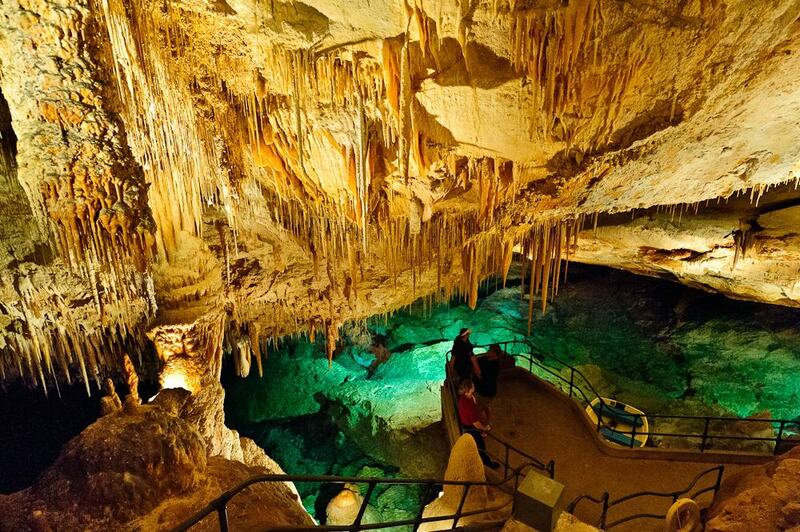 Having been carved and sculpted over more than 30 million years, the duo of great caverns offers visitors a chance to see oodles of underground wonders. There are submerged lakes and pontoon walkways in the Crystal section, quartz-caked stalactites and more, while the Fantasy tunnel has calcite formations and bulbous boulders by the bucket load! Mashing up the kitchens of Asia, Thailand, Indochina, the Med and the Caribbean, the folk at Mad Hatters in Hamilton have garnered a reputation for cooking up some of the most interesting and ground-breaking fusion food in Bermuda. Dinner menu dishes like the spinach and arugula salads come imbued with coloured red peppers and with charred barbeque flavours to boot, while the mussels are doused in coconut curry as a nod to the West Indian tradition. There’s also a truly comprehensive wine list to match, with Italian pinots next to Argentinian reds. Standing tall above the town tops of St. George’s, the half-completed frontispieces of the appropriately-named Unfinished Church have been weathering the Atlantic breezes here since construction began on the site in the middle of the 19th century. The original intention was to replace the damaged Church of St Peter just down the road. However, thanks to a combination of financial problems and local disagreements, the replacement worshipping house was never inaugurated. Today, that means visitors can come and roam the apses and arches, the Gothic windows and half-raised stone towers, enjoying an atmosphere at once eerie and romantic, and learning all about the history of the Anglican parishioners of St. George’s. It was way back in the early decades of the 17th century that Bermuda’s first European settlers alighted on the island. They were the shipwrecked crews and passengers of a convoy on route to Jamestown, and later the famous founders of the oldest continually occupied colonial town with English roots in the Americas. That town was St. George’s, which now boasts a coveted UNESCO World Heritage tag for its wealth of aged sites and stories. Visitors can come and wander the enthralling old streets of the center, spying out the likes of the State House, Stewart Hall, and the harbourside King’s Square, where regular re-enactments add life to the historical tales. Culture vultures and heritage lovers heading to Bermuda should pay special attention to the unassuming white and grey frontispiece of St. Peter’s Church, which rises in the very heart of the historic St. George’s Parish. This 400-year-old worshipping house is hailed as the oldest Anglican church outside of Great Britain, and is actually still in use by the locals here! Check out the beautiful interior of exposed-wood beams and honorific plaques depicting the achievements and good deeds of the local parishioners, and be sure to see the gnarled cedar in the old cemetery, which has been rocked by hurricanes and storms aplenty! Crowning the far-flung tip of western Bermuda, where the cliffs of Somerset descend into the swells of the Atlantic Ocean, the Royal Naval Dockyard stands like a limpet on the rocks. For centuries this heavily fortified base was one of the kingpins of British military might in the region, playing integral roles in the War of 1812 and World War II alike. Today, the area has been transformed into a living, breathing example of history, with the old fortification palisades housing shops and eateries, and even acting as berths for the colossal cruise liners that stop by Bermuda throughout the year. There are also craft markets within, along with art centers and watersports outfitters! Attracting as many as 50,000 visitors each year, the National Museum of Bermuda is the most popular heritage center on the island by a long shot. The patronage is truly deserved though, with the permanent exhibitions housed within bursting at the seams with fascinating relics and tales related to the archipelago’s past. There are arrays of jewellery recovered from shipwrecks, collections of old coinage from centuries gone by, photographic odes to the beautiful Bermuda longtail bird, chronicles of WWII skirmishes and the capturing of German U-boats – the list goes on! Shimmering in hues of brilliant white on the bend of Main Island, the Gibb’s Hill Lighthouse is one of Bermuda’s most recognisable icons. It was constructed way back in 1846, intended to crown one of the highest points in the entire archipelago. The architecture is noted for its use of cast iron in place of steel (a relic of the pre-industrial age), while the 185 steps to the very top of the attraction offer up some of the most breathtaking panoramas around the Bermudan coast. At the base of the tower guests will discover the charming and appropriately-named Lighthouse Tea Rooms, where an afternoon brew complements the sightseeing perfectly! Imbued with Bermuda’s trademark pink sands, Elbow Beach runs its way along the southern edge of Paget Parish. It’s backed by the Coral Beach Tennis Clubs and a selection of charming seaside cocktail bars, while a peppering of sea-blue sun umbrellas and deck chairs, waxy palm trees and nearby cabanas mean there’s always somewhere to settle in for a serious sunbathing or relaxation session. Of course, there are also Bermuda’s usual turquoise waters and rugged cliffs ringing the cove, making Elbow a worthy rival to the bucket-list beauties of nearby Horseshoe Bay! Tom Moore’s Jungle (or the Walsingham Nature Reserve if you’re feeling serious) is an enchanting little swathe of off-the-beaten-track wilds nestled atop the cliffs between the Harrington Sound and Castle Harbour. A patchwork of dense calabash groves and gnarled tree trunks, its 12 acres are cut-through by a series of mud tracks and winding pathways, inviting visitors to leave behind civilisation for a spell and delve into the lightless, shadowy woods. And the name? Well, that’s to doff the cap to one Thomas Moore – a famous Irish poet who’s said to have scrawled many verses here. Located smack bang on Front Street in the very heart of downtown Hamilton, this lively and welcoming Irish folk pub is now nothing short of legendary on the city’s line-up of drinkeries and eateries. Established way back in 1988 by a traveling native of the Emerald Isle, the spot has become famed for its wealth of international and Irish beers and ales, a seemingly endless selection of filling pub food (expect the likes of deep-fried wings, crab bites and burgers), and raucous nights of sports watching in the adjoining sports bar – especially when there’s cricket on!